Most famously known as the cool and logical half-Vulcan first officer on Star Trek, Nimoy shot to fame and popularity beyond anything ever seen in television. Initially he resented his fame and the type-casting it brought him, which he discussed in his 1975 book, I Am Not Spock, but by 1995, in his sequel, I Am Spock, he had come to grips with both the character and how it had effected his life. 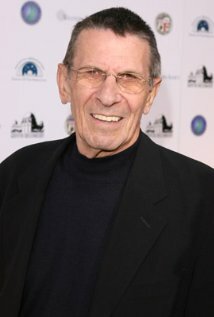 In addition to Star Trek, Nimoy also had a recurring role as Paris in season four and five of the original Mission: Impossible, and voiced the paranormal exploration documentary series, In Search Of… , in addition to countless television guest roles and films such as A Woman Called Golda and the remake of Invasion of the Body Snatchers. Nimoy had an extensive theater career, starring on Broadway in Equus and Vincent, a play he himself adapted about van Gogh. He became a successful director, directing not only the third and fourth installments of the Star Trek franchise, but Three Men and a Baby, the highest grossing film of 1987. Nimoy had a life-long love of photography, one of his greatest passions. He had several books published, as well as exhibits at the R. Michelson Galleries in Northampton, Massachusetts and the Massachusetts Museum of Contemporary Art. (Nimoy was born in Boston, and remained faithful to the area.) In addition he published several volumes of poetry, the most recent being 2002, A Lifetime of Love: Poems on the Passages of Life. Following the poetry angle, Nimoy tried to make a singing career, putting together albums as early as 1967. He wrote the song “Maiden Wine” that he sang in the Star Trek episode “Plato’s Stepchildren.” To be dreadfully honest, some of the songs live in infamy as being so painfully bad, they’re camp. Perhaps it was just the songs chosen, or the musical direction. I was part of a room skyping with Nimoy last August, during which he sang a song for us that he had written, and not only were the lyrics beautiful, he sang it beautifully as well. Perhaps Nimoy’s voice just needed to mellow with age, but I wish I had a recording of that. Nimoy mourned the fact that even though he had quit smoking thirty years before, his COPD was a direct result of having smoked, and urged everyone to quit immediately, and better yet, never even to start. I had seen Nimoy in person at least twice, three counting the skype, and he never failed to please a crowd. He was honest and sincere, speaking about science, space exploration, and philosophizing about it all. He never displayed the arrogance of some television stars, and never spoke poorly about costars, as others have. If he had gripes, he kept them politely to himself. The world has lost not just a television icon, but a well-rounded artist of film, theater, television, photography, voice, and print. Truly, he was someone who lived long – and prospered.